The Malaysian Grand Prix arrived almost too soon for some people, not least the Malaysians themselves. As the team members arrived back from Europe, having filled the cargo holds of their airliners with top secret bits of racing cars, the race organizers at Sepang were publicly debating whether or not five months was long enough between Grands Prix as the poor ticket sales took their toll on the prospects for a profitable weekend. Upon arrival there were two popular topics of conversation; Heinz-Harald Frentzen's alleged allegations that something was rotten in the state of Modena and the potential repercussions from the accident in Melbourne. Both were swiftly muffled, however, as all conversation was cut to a minimum by the oppressive heat and humidity of Sepang in its late summer. The weather was to be a new challenge for Michelin, a random variable thrown into its quest to catch and pass Bridgestone in their private battle. Pierre Dupasquier, Michelin's combustible boss, was in typically pugnacious mood on the run-in to his latest challenge. "It's a factor but not a major factor," he said. "Sliding of the cars and downforce and stuff like that is probably more important than general ambience." In reply Bridgestone's Hiroshi Yasukawa said that "This race track has very hot temperatures and I think tire wear is short. But I believe in our tires." Initially, however, there were no lap times to shake the world in quite the same way as was the case in Australia. With the FIA nervously watching overhead and poised to throw in emergency regulations to slow the cars if necessary there were no four second leaps from last year's performance. The reason was clear as to why, there were seven months of extra development last year between Australia and Malaysia. According to the form book after the opening round it seemed that only something untoward would turn the run of play away from Ferrari, and from early on in Friday's free practice that form held true as first Rubens Barrichello and then Michael Schumacher set the pace. As on the first day in Melbourne, however, the serious-looking Jordan was right there with them and Jarno Trulli hooked up all the sections of the lap to produce a sizzler in the dying moments of free practice. With his name atop the timesheets Trulli made the overnight headlines at the track - while team mate Heinz-Harald Frentzen also set tongues wagging... with his debate over traction control, Ferrari and Sauber. Although it seemed that Jordan was consolidating its position as the nearest challengers to the top two - meaning the two Ferraris as opposed to the two teams of Ferrari and McLaren. The silver cars were in uncharacteristic disarray, David Coulthard unable to join Trulli and the Ferraris in the 1m 38s bracket and Mika Hakkinen a full second from the fastest time of the day, spinning off at the end of the second session. Among the Michelin men, the Williams pairing of Ralf Schumacher and Juan Pablo Montoya struggled on the opening day, Schumacher not getting the FW23 to go round corners properly and Montoya suffering a fuel pump failure and an alternator failure in the afternoon to the extent that Eddie Irvine's Jaguar took up the running as the fastest Michelin car, spending most of the day in the top three until pushed down to fifth by the close of play - an encouraging start to Jaguar's weekend nonetheless. Within the BAR ranks Olivier Panis again outpaced his illustrious teammate Jacques Villeneuve and the young pups at Sauber picked up where they left off in Melbourne, darting in and out in the top ten for much of the day. Nobody, though was clearly dominating as the teams prepared for day two and qualifying. With the biggest gap between any two cars measuring a scant 0.388s the importance of track position and the timing of qualifying runs would be paramount. Behind them Arrows put on their usual good form on Friday but Jean Alesi was clearly struggling with his Prost, not getting within three seconds of Trulli's time despite putting in more laps than anyone else. It was a better day for Jean than for the Benettons, however, where Jenson Button currently faces the prospect of scrapping with the Minardis. Saturday began, as in Melbourne, with McLaren having got its sums right to put both Hakkinen and Coulthard well into the 1m 36s zone, the pace accelerating for the first time past last year's pole position time of 1m 37.397s. Ultimately though the morning pace was set by Ferrari, with Barrichello continuing his strong form but hard on his heels was a Schumacher - albeit the younger variety. As Michael took a grassy excursion at turn six Ralf picked up the family cudgels with Williams recovering spectacularly from its opening day disappointment. The prospect of the blue and white cars to add a little spice to proceedings was welcome, as were the fruity little displays of car control from both Schumacher and Montoya as they each produced the closest thing to a four wheel drift in modern times. We shall miss such exuberance come Barcelona. The scene was set for a fun-packed qualifying hour and that was exactly what was delivered. After the Arrows and Minardis had made the early running and got that invaluable airtime for their sponsors, Jarno Trulli led David Coulthard out after 12 minutes to light the blue touchpaper. Trulli's first lap was a blow-out however, he followed in Schumacher's wheeltracks through the grass at turn six and dived straight back into the pits to remonstrate with himself. Coulthard thereby put himself clearly at the top of the class in 1m 37.124s and stayed there ahead of Jean Alesi and Jenson Button until Ralf Schumacher came out. The Williams got round over eight tenths of a second faster than Coulthard's opening gambit without breaking sweat and the speed trap showed that the six-hundred or so revs that the BMW has in hand over all the other engines results in prodigious straight line speed. With the chassis also now properly dialled-in and Montoya slotting in to third place after a total of five laps experience of the circuit the threat was clear to all. Olivier Panis got the edge over Jacques Villeneuve in the BAR camp after their first efforts, putting them in third and fifth temporarily but next up were the Ferraris and when it counted Schumacher asserted his authority over Rubinho with a lap of 1m 36.282, shading the number two Ferrari by .033 of a second. Trulli then reappeared but could do no better than sixth and went back for another rethink, and while he and Frentzen both studied the telemetry Ralf Schumacher flung the Williams round in 1m 36.036s to take pole away from his big brother. Montoya clung on grimly to take fourth place as Barrichello went out and took pole back for Ferrari by nearly three tenths, getting well into the 1m 35s where he was followed by his world champion team mate, who took pole position back from him. Little brother had no intention of relenting however, and Ralf shoved the Williams ahead once again. The session was now racing to a finish and barely was Ralf back in his pit than Michael was on the way out again. The Schumi show now dominated the day, only serving to highlight the anonymous performances beneath as everyone tried to remember when the last all-sibling front row happened in a Grand Prix. (The answer is never). Michael was fractionally down over the first sector but gained a quarter of a second through the more wiggly second sector, his car some 10 kp/h down on the Williams through the speed trap. It was just enough, as Ralf conceded with a wry smile, to take pole back by two tenths - so the yellow helmet went back on and the Williams went back out again. Ralf was bang on target over the first sector but he was way, way too deep into turn five while trying to make the Williams behave like a Ferrari through the bends. The pole was conceded and then, as he slowed down, Barrichello stole through into second place with his best effort of the day to end any dancing on the streets of Kerpen... for the time being at least. The two Ferraris were ahead of a Williams, a McLaren and a Jordan, perhaps indicating the start of a new world order but then perhaps not. On balance the BARs were next up, followed by the Saubers, with Eddie Irvine and Jean Alesi each flattering the Jaguar and Prost respectively strapped to them. The Benettons just shaded the Arrows of Verstappen and in theory his team mate Bernoldi, but the Arrows was found to be running its wing too low and thrown to the back of the grid behind the Minardis, of whom Marques survived more lurid moments to better Alonso by half a second after the Spaniard took his turn for an engine failure. Sunday dawned in the last throes of a mini monsoon. Even while petering out it was an impressive downpour, and despite an hour of calm after the storm the cars went out for warm-up on a sodden circuit as, with no support races save a Proton race later in the day, there was nobody to help mop up the water. Fernando Alonso led the way to the end of the pit lane before his engine stopped, and soon Eddie Irvine was walking back too, his Jaguar lifeless between the first two corners. The wet weather tires did their job and soon the circuit was just wet rather than waterlogged, which was when the Ferraris started lapping almost five seconds faster than anyone else. It renewed the debate over whether or not Ferrari has indeed got anything exciting installed on its cars, but intermediate Bridgestones on the Ferraris made a lot of difference on the drying surface. When the cars came to the grid everyone was on soft dry weather tires except Luciano Burti's Jaguar in a bid to dispel his anonymous weekend. Michael Schumacher sat on pole in his T-Car, which he elected to take five minutes before the start following an oil leak. At the green flag Frentzen loitered on his ninth place slot and held up the entire left hand side of the circuit as he struggled with a misfire. He fell back through the field and for some reason several of the cars decided to shuffle themselves up a little. The Safety Car swung in behind the grid, the lights went on and then Fisichella, who was hopelessly out of position, took it upon himself to cross back to his original grid spot and sat perpendicular across the track. Frentzen arrived just in time to see the lights turn red in his honor as the stewards began to investigate Jos Verstappen after doubts over whether the Arrows was free of mechanics by the time the 15-second call was made. The second attempt at a green flag lap saw Juan Pablo Montoya's car stranded. The spare Williams was already undergoing final checks before Montoya ran back and he strapped into the Williams, its BMW running, as the Ferraris resumed their positions on the front row. It was a close thing, and had Fisichella found last place on the grid straight away it would all have come to nought. As it was Montoya made it to the end of the pit lane before all the starting lights were on, so he was cleared to go for the reduced 55-lap race thanks to a new rule introduced last year. Finally the lights went out and Michael Schumacher shot into the lead as his compadre Barrichello found himself being passed on the outside by Ralf Schumacher. Ralf's car twitched intimidatingly towards the Ferrari on the way past but Rubens was having none of it. He clung tenaciously to the inside of Turn One and offered the Williams the opportunity to leave some room or go off. Ralf being Ralf he attempted to close the door and for the second race in succession Barrichello had good reason to be thankful for the robustness of his left front corner. The Williams spun with the rest of the field following several at a time, causing a few wobbly moments when confronted with a Schumacher staring back at them and Eddie Irvine, disputing the midfield with Jos Verstappen, got knocked into a half-spin as Kimi Raikkonen pulled up alongside the pit wall, his transmission broken. "He was quite brave to brake so late," said Barrichello, "but when you're there you know that the track is quite difficult to overtake, you have to fight for your own position... I admit that he was in front but then all of a sudden he just shut the door and I was there, if you want to fight for the position that's cool but just leave some room." Once everybody had sorted themselves out over the next couple of corners, Schumacher found himself with a healthy lead from Barrichello with Trulli third. David Coulthard trailed the leaders in fourth after diving onto the grass underneath the mess at the first corner and finding himself four places better off for doing so and Frentzen was fifth ahead of Verstappen, Villeneuve and Hakkinen. On the second lap Olivier Panis left the circuit backwards at Turn 6 with a gigantic flame swamping the back of his car from an oil leak, and almost immediately the first few drops of rain fell to make the resultant slick all the more treacherous. The two Ferraris, seeking to press home their advantage, arrived aware of the rain but not of the oil and speared off the road in unison. Neither car hit the barriers but they both skittered dangerously close and they narrowly avoided each other in the process. Barrichello bounded over the rougher stuff to regain the track before Schumacher but behind Trulli and Coulthard as the drizzle swelled into another mini monsoon that swamped the circuit with everyone on their soft, dry tires. The combination of oil and deluge at Turn 6 accounted for Villeneuve, who sailed deep into the gravel and went on to claim Heidfeld and Bernoldi as Verstappen just got away with his 'moment'. By now the whole circuit was a hazard however, and as they came in to the final corner both Trulli and Coulthard aquaplaned off helplessly but they were able to rejoin without great loss, unlike Montoya whose bad day came to an abrupt end. Before the Safety Car was called out to lead the fifth lap the standing water had accounted for four cars and sent a total of eleven hurtling off around the circuit including Barrichello (again), Button, Mazzacane and Alonso. As a result the pit lane was a crowded place, and nowhere more so than the Ferrari pit, where Barrichello arrived first and Schumacher sat impatiently behind for a full 72 seconds as the gravel and detritus was cleared out from every nook and cranny. When they rejoined the Ferraris were in 10th and 11th position a long, long way behind the Safety Car. They also opted for intermediate tires that had served them so well in the morning warm-up, although everyone else played safe with full wets and felt glad to have done so as they floated about behind the Safety Car. Following the stops Coulthard led Verstappen but, realizing that he had gone past Frentzen under yellows, he let the Jordan through Behind him was Hakkinen, Trulli, Alesi, Fisichella, a grateful Ralf Schumacher and Mazzacane. The storm had blown over by lap seven but the surface water was proving stubborn and the Safety Car stayed out for three more laps, allowing the 16 surviving cars to bunch up before they were released - and for a good deal of the standing water to be displaced by the pack. As David Coulthard set about establishing his lead Jos Verstappen surprised Frentzen as he accelerated back into second place while Ralf Schumacher shot from eighth to fifth past Fisichella, Alesi and Trulli. Alesi, who had raced up the order before the pit stops, found his Prost to be cursed with oversteer on its wet tires and slipped backwards and was soon devoured by the two Ferraris, who were on quite unbelievable form. On lap 12 Schumacher trailed Barrichello as they both charged up behind Jarno Trulli's Jordan. Barrichello made a go inside, was blocked and then suddenly found Schumacher barging past the two of them at the right-handed Turn 5. It was a contretemps and yet as they crossed the line Schumacher's time was a second quicker than Coulthard untroubled but pressing on in the lead. "That's something that was a bit sad, to be honest," said a plainly annoyed Barrichello afterwards. "It's something that I told Ross (Brawn), that I would take very much careful because there were some bits of the track that were really, really wet but I wanted to make time and I was making time. I came in too close to the car in front, I lost a bit of momentum and at that time he took the chance. At that time I'd say a team mate would wait behind and wait for some chances in front." On the next lap Schumacher passed Frentzen, his brother Ralf and Mika Hakkinen's McLaren and although diving off line, in the strongest possible traffic, he stopped the clock at 1m 54.948s to leader Coulthard's 1m 57.590s. The world champion closed in on Verstappen on lap 14 with a time of 1m 53.807s (to Coulthard's 1m 57.701s), but struggled to find a way by an Arrows which almost had his measure. Finally on lap 15 the job was done and Schumacher crossed the line monstering the gearbox of the McLaren, then swept round the outside of Coulthard imperiously at Turn 1 to assume the lead as Barrichello went through to second. "With the time difference at five seconds a lap you're not comparing like for like," said Coulthard. "In reality it's not going to be until we get back to Europe that we can address that properly. I don't think you've seen the full potential of our car, you're seeing a very good Ferrari against a not-quite-sorted-out McLaren at the moment." The race was effectively over from that point. As the circuit dried out Schumacher put five seconds a lap between himself and Coulthard for the next four laps with Barrichello riding shotgun midway between them. The demolition job continued until lap 25, when Coulthard joined the many pitting for new dry rubber but by that stage Schumacher had lapped everyone up to seventh-placed Frentzen, and although he was on treaded tires on a dry circuit Schumacher - as at Indianapolis last year - continued to stay out, building his lead. Finally on lap 30 he pitted, over a minute clear of the dry-shod sister car of Barrichello. A relaxed stop - his only one for fuel - saw Schumacher drive out to complete the remaining laps at his leisure, although Barrichello did narrow the gap as best he could, smarting from Schumacher's earlier dismissal of him behind Trulli. A long, long way behind Giancarlo Fisichella parked the Benetton with no fuel pressure on lap 31. Behind them Coulthard plugged on, feeling grateful for the podium position at least after his lowly qualifying position, as Ralf Schumacher's string of fastest laps were unable to keep Mika Hakkinen from taking that honor late in the day - although Ralf still held the McLaren at bay to the finish. "The collision with Barrichello at the first corner is hard to understand," he said. "But it was a good feeling anyway being able to keep Hakkinen behind me." Only the top seven finishers ended the race on the same lap, Verstappen pitting for a third time on lap 43 to get to the end of the race in seventh with Trulli, Alesi and Burti coming home behind. Two laps down were Button suffering from spins and Mazzacane whose lack of pace was compounded by refuelling problems while the Minardis finished three and four laps behind, glad to have two cars home especially after last man Marques had a Michelin lose its tread in much the same way Jenson Button's did in practice in Australia. 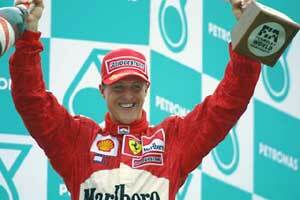 They would say it was probably as good as a victory, but only Michael Schumacher would know how that felt. "This race demonstrated Ferrari's and its drivers' superiority," said Jean Todt, "and also that of the Bridgestone tires." Few people would disagree with that, especially not Michael Schumacher. "As for the records I am setting at the moment, it is nice," he said after his sixth successive victory - a modern record - in a weekend which put him clear second in the all-time pole winner's rankings. "But they don't count as much as how many wins and championships you get."